One of the best things you can have installed in your home is grab bars. This is especially useful in areas of the home that have slippery floors, such as the bathrooms. It can be very easy to slip and fall in these areas, which can lead to severe injuries. 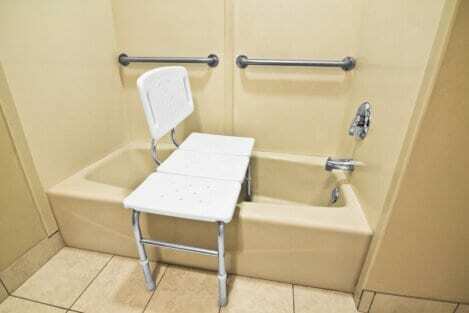 However, with a grab bar, it is possible to maintain your balance. They also provide other convenient uses as they can be used as towel racks or something to help get up after soaking in the bathtub. We offer a superb grab bar installation in New Jersey. Traversing up and down stairs can increase your risk of falling and getting injured. Especially, in the areas of the house that only have two or three stairs that transition to different rooms or at the front door. These stairs can pose a very big risk of falling but through our services, we can provide a solution. It is possible to replace these risky stairs with ramps. Ramps will make it easier to traverse and also make it possible for individuals with wheelchairs to enter those areas of the home without assistance. We also offer superb home maintenance in New Jersey. Through these services, we can help maintain many of the modifications you put in place to make your home more convenient for you. We can also help maintain and repair other aspects of the home. Those are just a few ways you can make your home more convenient and accommodating to your unique needs. If you would like to find out more about this or about our exceptional services, please feel free to get in touch with us at AIP Mobility Plus for more information.